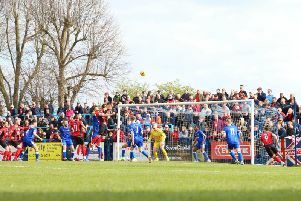 John Ramshaw believes the Kettering Town fans who travelled to Weymouth had “every right to feel let down” after the Poppies slumped to a second Evo-Stik Southern League Premier Division defeat in a row. Having fallen behind early on, Kettering battled back to lead 2-1 at half-time thanks to goals from Brett Solkhon and Aaron O’Connor. But, having lost Solkhon due to illness at half-time, the Poppies capitulated after the break and Weymouth hit back to win 3-2 with Stephane Zubar heading home the winning with just three minutes remaining. And assistant-manager Ramshaw, who took charge of the team with boss Marcus Law absent due to “business commitments”, was furious with the way the Poppies fell apart in the second half. “It was a very long day for the team and the supporters and it was very disappointing. “I think the fans have every right to feel let down by what happened. “It was a very poor second half after what had been a decent display in the first half. “We were forced into making changes because Brett Solkhon was unwell and he is still feeling the aftermath of flu. “But just because we made those changes, it doesn’t excuse the abject performance that we produced in the second half. “We fell apart, it was as simple as that. “We actually started the game pretty well but got caught on the counter but we got the goal back and when we scored the second I thought it was fully justified because we were in control of the game. “We had a big shout for a handball and a penalty not given so we could have easily gone in 3-1 up. “But we had to make the change because of Brett not being well and then the defending for the two goals we conceded was terrible. “We had the chance to clear our lines in the build-up to the penalty and then Liam Canavan has left a foot out and their lad has taken the chance to go over it. “But the third goal was totally unacceptable. It was a short corner, no-one has gone to pressure the ball, the lad has had plenty of time to pick out the runner who wasn’t picked up and he has gone between the two centre-halves and scored with a header from 10 yards out. The Poppies are due to be back in action on Tuesday night when they head to title contenders Leamington.